Tom Yum is a spicy and sour soup that is very popular throughout Thailand, and can be found in nearly every Thai restaurant around the world. Tom Yum has a distinct spicy hot and sour flavor, with the fragrant herbs lemongrass, kaffir lime leaves, and galangal used generously in the broth. The sour flavor comes from lime juice, it's saltiness comes from fish sauce, and crushed hot chili peppers contribute an extra spicy kick. Many different version of this soup exist. 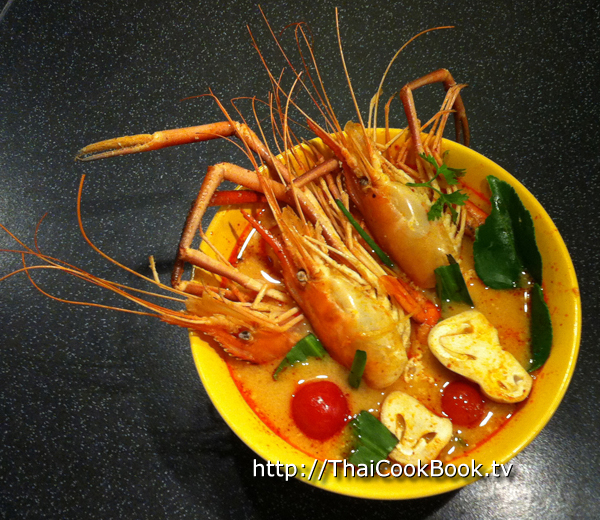 The most well-known is called Tom Yum Goong ( ต้มยำกุ้ง), which has fresh or saltwater shrimp added. This recipe for Tom Yum Goong has a small amount of condensed milk added at the end, which turns the normally clear broth white / orange. 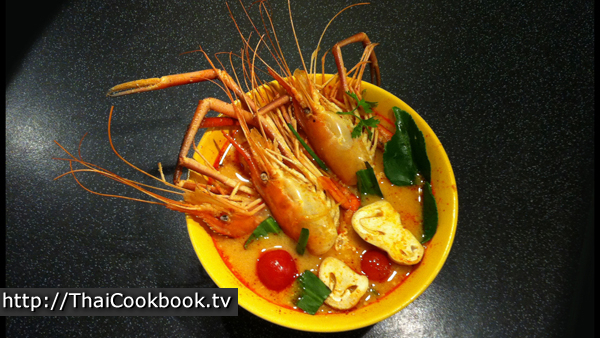 This type is most commonly referred to as Tom Yum Nam Khon (creamy tom yum). The taste is fantastic, and these jumbo sized river prawns were amazing. What's in our Spicy and Sour Prawn Soup. 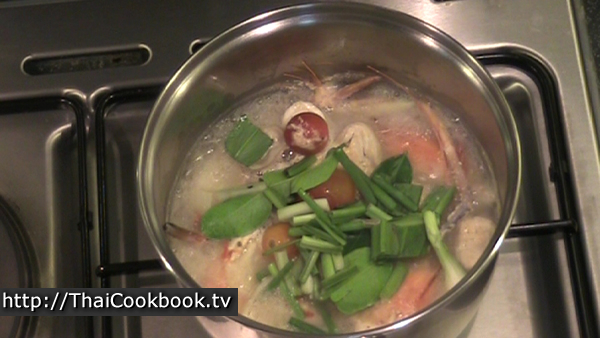 How we make our Spicy and Sour Prawn Soup. 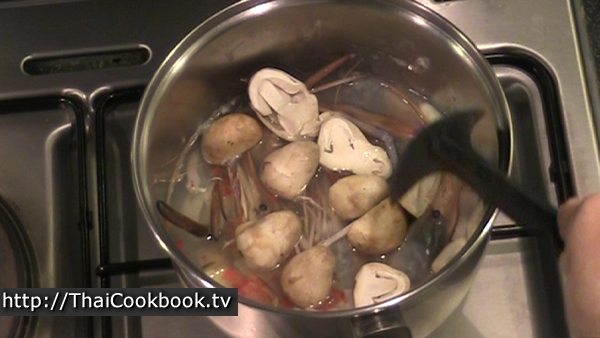 1) Boil 2 cups of water in a small pot or pan. Add the galangal, lemongrass, onion, and crushed red hot chili. Boil for 1 minute. 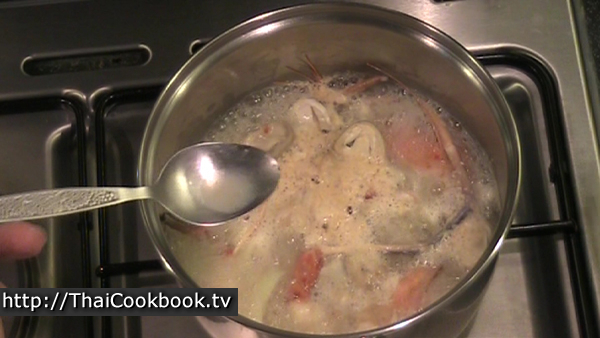 2) Add shrimp and bring back to a boil. Add mushrooms and sugar, and boil everything for 2 minutes. 3) Season to taste with lime juice and fish sauce, balancing salty and sour flavor. 4) Add the kaffir lime leaves, green onion, culantro, and tomatoes. 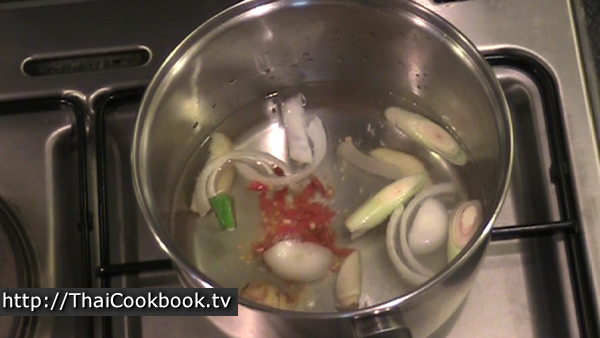 5) Add the Nam Prik Pao sauce and stir it in well. Then add condensed milk and stir again until well blended. Serve immediately. Select 4 large shrimp, river prawns, etc. Use more if they are small. Carefully peel the shell from the main tail portion, leaving the head on and the tail shell on. 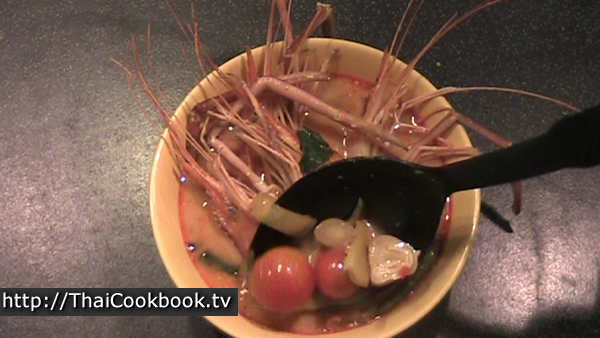 The head adds a lot of flavor to the soup, so it should be left on for an authentic Tom Yum Goong. Wash and careful devein them. Wash the straw mushrooms and cut them in half. Wash and slice the galangal into thin pieces. Cut the bottom portion of the lemongrass stalk into 3 - 4 short pieces. Cut 1/4 of a small onion into thin slices. Finely crush 2 Thai hot chilies using a mortar and pestle. Break open 4 - 6 small Thai hot chilies just a little using the pestle. They should be left whole. Measure and assemble the rest of the ingredients, and have them ready for quick use in the soup. Boil 2 cups of water in a small pot or pan. Add the galangal, lemongrass,onion, and crushed red hot chili. Boil for 1 minute. Note: Thai red chilies are very spicy. If you don't want it too spicy, then start with just a little and add more as needed after you taste the soup in step number 8. Add the shrimp to the water. If they are not covered by the water, then add a little more. Add the mushrooms, then bring the soup back to a boil. Boil for 2 minutes, stirring carefully. Then add the coconut sugar. Next add the salt, fish sauce, and lime juice. Stir in well and boil for 30 seconds. Taste the broth. It should be spicy, a little salty, and a little sour. You can add more red chili (spicy), fish sauce (salty), or lime juice (sour) to balnce the flavor as you like it. Add the kaffir lime leaves, green onion, culantro, and tomatoes. 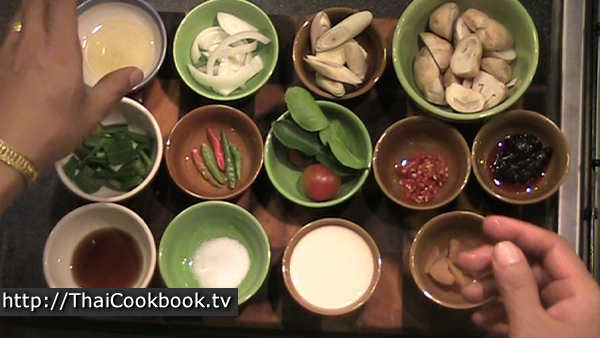 Add the Nam Prik Pao sauce and stir it in well until it is completely melted and blended with the soup. 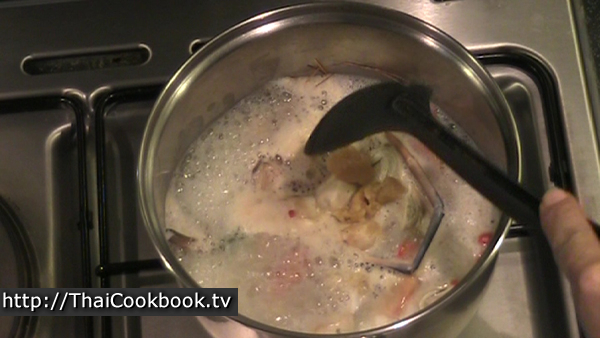 Add the condensed milk to the soup and carefully stir in in until well blended. Remove the shrimp, tomatoes, and a few nice mushroom pieces and set them on a plate. Spoon the rest of the ingredients into a small bowl that is just barely big enough. Fill the bowl with broth to just cover everything, then carefully arrange the shrimp on top, with heads and legs sticking out. Add in the tomatoes and mushrooms wherever they look nice. Garnish with fresh kaffir lime leaves. Float a few whole Thai hot chiles, some cut culatro leaves, coriander leaves, and a little raw green onion on top. Tom Yum is normally served as a shared dish. Each person should have a small plate of steamed Thai Jasmine rice. The soup is spooned onto the rice with your own spoon, one spoon at a time, mixed in and eaten. If you prefer not to eat Thai style, then serve in smaller bowls, one for each person.